WARRIOR’S PATH is the project of the guitarist Andreas Sinanoglou, and it features a team of experienced musicians like Bob Katsionis – also in ODYSSEY DESPERADO – (who has also produced the album, owns the record label and manages the band) on bass/keys and Yannis Papadopoulos on vocals – also in MAJOR DENIAL and BEAST IN BLACK. When the promo arrived it was described to me as an album similar to “Privilege of Power” of RIOT V, classic power metal the American way. Honestly it is not exactly like that, but it does have a solid 80’s sound foundation. As I mentioned earlier, the band draws lots of influence from the 80’s metal scene, yet I think their main influences are mostly from European metal scene. Yes, you can hear lots of RIOT (“Thundersteel” & “Privilege…” era), some CRIMSON GLORY or QUEENSRYCHE, but I think that HELLOWEEN, HEAVEN’S GATE, SCANNER and PRETTY MAIDS influences are more dominant. And while this is not a Euro-power metal album it does manage to combine the best of both worlds: European speed power drumming and melodic guitars, next to American lyricism and catchy choruses, all of them painted with an epic feeling. And before you ask, YES, there are plenty of 90’s – 00’s references especially to underground stuff: LOST HORIZON, EMERALD, RAWHEAD REXX, DOMINE, CRYSTAL EYES, BATTLEROAR, BATTERING RAM, DOOMSWORD and others. Listening to the album was a great experience. The songs are imbued with a genuine nostalgia and a dreamy epic feeling, with great lead guitars and galloping rhythms. There is balance between power and melody. For example “Riders of The Dragons” could be a great BATTLEROAR song, while “The Hunter” and “Fight for Your Life” leans more to power metal. “A Sinnersworld” has a RIOT vibe (“Johnny’s Back”) and “Stormbringer” and “Mighty Pirates” bring back the epic essence of “Riders…”. 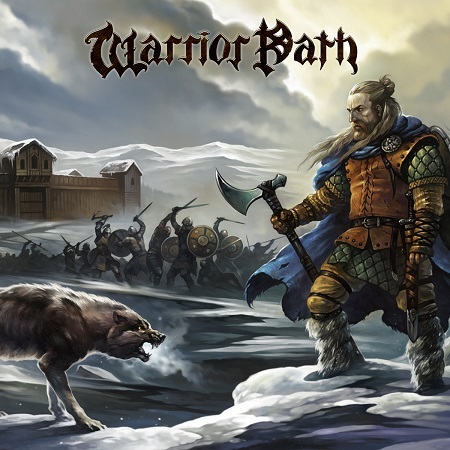 The highlight of the album is the title track, “The Path of The Warrior”, an epic, 9-minute song with great singing along with beautiful lead guitar work. There are three ballads included in the album: “Black Night” which climaxes to a great anthem, “Dying Bird of Prey” which I didn’t like much, and “Valhalla I’m Coming” which closes the album beautifully. To sum it up, I believe “Warrior’s Path” is a great album. It contains some really cool songs and captures the magic of the underground. It’s a genuine effort in need of support. I would strongly suggest to Andreas to complete the line-up and do some shows as it would elevate them to higher levels. Do yourself a favor and listen to it.